Accessories: Accompanied by Extract from the Archives confirming production of the movement of the present watch in 1927 and its subsequent sale with stainless steel case and silvered dial featuring black enamelled hour markers and pulsation scale on 24 March 1937. Single-button chronographs are amongst the rarest gems within the family of complicated Patek Philippe wristwatches - itself already one of the most exclusive clubs a watch may belong to. These ultra-rare chronographs, fitted with the celebrated 13’’’ ébauche supplied by Victorin-Piguet of Le Sentier, were always cased in gold, with two exceptions finished in stainless steel: case numbers 504’146, the present watch, and 504’147, its identical sister. The latter is now part of the Patek Philippe Museum’s collection and on permanent exhibit in the salon dedicated to complicated wristwatches; furthermore, it is also prominently featured on the Museum’s own website (www.patekmuseum.com - The Collection – Patek Philippe Collection – Complex Wristwatches (1925-1989 – the Doctor’s Wristwatch). 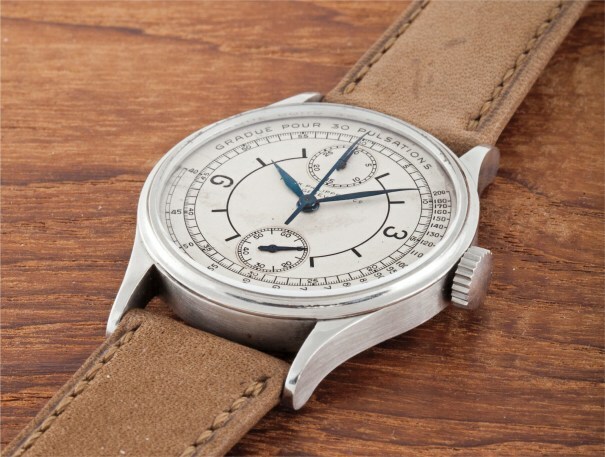 Consequently, the present example is the only known steel single–button chronograph by Patek Philippe in private hands.Patek Philippe finished its single-button chronographs first in the well known officer–style and cushion–shaped cases and later on in the better known reference 130 style. These were, like later references 130, measuring 33mm in gold and a mere half a millimetre more for the steel version. The present watch, however, boasts a much larger and substantial case with a diameter of over 35mm.The dial design of these two watches cannot be described differently than with words like unique and spectacular: A matte silvered dial with vertically positioned subsidiary dials, the typical late 1930’s sector- (or aviator) design, elegant arabic numerals in black enamel and outer pulsation scale – a combination unique to these two watches. Both watches were sold and delivered on the very same day, March 24, 1937, to Walser, Wald & Cia, Patek Philippe’s agent in Buenos Aires, Argentina, at the time. Unconfirmed but reliable sources say that these two watches were made for two brothers, both medical doctors.Since its first public appearance at auction over 20 years ago, the watch has seen only two ownerships – in both cases two extraordinary connoisseurs and collectors with deep knowledge and passion for the finest and rarest. Thankfully, none of them have restored it, resulting today that it is preserved in a superbly honest and original condition. In fact, it appears that the stainless steel buckle mounted is still the very same and original one from 1937.It should not come as a surprise that this watch has been chosen by John Goldberger, legendary author and one of of the world’s most renowned scholars, for his book Patek Philippe Steel Watches (pp. 212 – 215), broadly accepted as the bible for stainless steel watches by Patek Philippe. Amongst the handful watches to which Goldberger dedicated 4 full pages, the present single-button chronograph is one of them, revealing its importance and uniqueness for collectors.